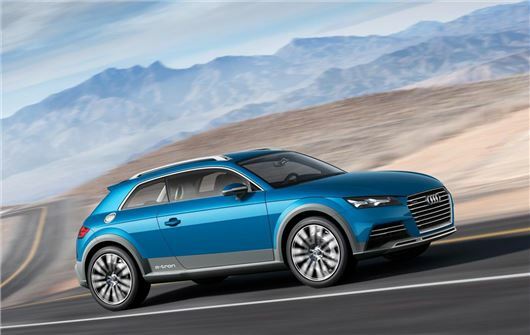 Audi is to debut a hybrid powered crossover concept at the North American International Auto Show in Detroit this month. The Allroad Shooting Brake is powered by a 2.0-litre TFSI engine and a pair of electric motors, with a total system output of 408PS and 650Nm of torque. Transmission is a six-speed S Tronic automatic. The car previews how the next Audi Q3 may look and showcases some of the future technology Audi is working on. Highlights include a lightweight body made of aluminium and carbon fibre along with a plug-in hybrid e-tron hybrid system. It features two electric motors, one in the transmission and one in the rear axle. These, combined with the engine, make for impressive performance. Acceleration from0-62mph takes 4.6 seconds but official emissions are just 45g/km with economy of 149mpg. Because this is a plug-in hybrid it can be charged from the mains and can run on electricity alone for 31 miles. Selectable drive modes allow the driver to hold the charge for driving in town. The styling features a few nods to current and past Audi vehicles, with a TT style rear end and light clusters, and slim headlights like those seen on the current crop of Audi saloon cars. Perhaps more importantly the general dimensions and the roofline are very similar to the current A3, which could well mean this model previews a new two-door Q3 crossover model similar to the Range Rover Evoque or MINI Paceman. Inside, the Allroad Shooting Brake previews the next generation MMI interface system, for controlling everything from the radio to the suspension set up. The new system uses a smartphone inspired interface with text search function and gesture control. The screen itself is behind the steering wheel, meaning the driver can keep eye forward more of the time. Another technological highlight is an inductive, wireless mobile phone charging system. Aside from these high-tech details the cabin is quintessential Audi, with a minimalist design and high quality, lightweight materials. There’s no official word on whether this model is set to go on sale, but if it does expect to sit above the A3 and to cost from around £27,000 with a more conventional engine.